Chance the Rapper says he wants to move there and tech billionaire Peter Thiel has become a citizen. Wellington-based journalist Ben Collins asks whether New Zealand is becoming a "utopia" for Americans looking to leave. Forget bunkers in the forest full of food tins and bottled water - it seems New Zealand, with a population of 4.4 million, has become the best option for a new breed of American survivalist. When the New Zealand Herald revealed this week that Silicon Valley tech billionaire Peter Thiel had become a citizen and purchased a lake-front estate it perhaps shouldn't have been a surprise. Mr Thiel, who previously said New Zealand was a "utopia" and has invested heavily there, is just one of several US migrants who have realised what the country has to offer. New Zealand recently overtook Singapore as the best place to do business, according to the World Bank. Transparency International ranks it as the world's least corrupt country, and the 2016 Global Peace Index said it was the fourth safest behind Iceland, Denmark and Austria. "We've definitely had an increase in American inquiries, and at least one sale that has been a direct run-off from the presidential result in the United States," says Nick Horton, an agent specialising in luxury real estate. "There's just a feeling that people want to create a bolthole in the southern hemisphere that's away from some of the problems facing the Western world," he says. Recently, the New Yorker magazine ran a piece titled Doomsday Prep for the Super-rich. 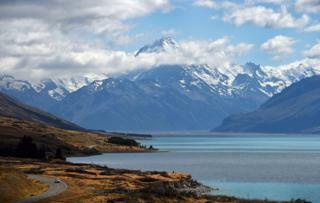 It detailed the rise in wealthy investors who see New Zealand as their escape from a volatile world. It is safe and clean. The west coast of the United States is a 13-hour flight away, and modern technology has tamed the tyranny of distance. The temperate, mountainous country is also comparably well-placed to deal with rising sea levels, and its most recent major attack was in 1985, when French spies blew up a Greenpeace vessel in Auckland harbour. However, as Horton explains, the interest from the United States is not new. "The same happened after the global financial crisis, and the same thing happened after Obama was elected, when some people thought the United States wouldn't tolerate having a black leader." According to Immigration New Zealand, in November 2016 when the US presidential election was held, 17,584 people registered their interest to study, work or invest in the country, compared with 1,272 in November 2015. In the two days following the election, the agency said its website received 88,353 visits from the United States - compared to a usual daily average of 2,300 visits a day. Registrations have remained higher than average, with 3,159 received this month, compared to 1,724 in January 2016. However, registrations are far higher than actual visa applications. Between October and December last year, 348 residency visas were granted to people from the United States, compared with 338 in the same period in 2015. Work visas rose from 2,296 to 2,699 over the same period. "What we are experiencing at the moment is a slight increase in visas issued to American nationals, both temporary work visas and permanent resident visas," Steve McGill, general manager at Immigration New Zealand, told the BBC. "We have had a pretty active strategy of identifying investors out of America over the past few years. "It's a combination of our marketing effort, and a bit of global uncertainty that means New Zealand is a pretty attractive place," Mr McGill said. The revelation that Mr Thiel had quietly become a New Zealand citizen has raised some questions about the processes for foreign investors, with some politicians asking how, exactly, he was able to secure it and whether he was given special treatment. But Mr McGill said opposition to wealthy investors, who can secure a residency visa by spending a minimum amount in the country, was not a major issue. "I am aware of the recent commentary around Mr Thiel, but there is no evidence of any backlash against migrant investors coming in. What we do know is that many of the investors who come out deliver significant value in the form of job creation in the communities. "We are a small island nation at the bottom of the world with lots of resources and opportunities and we need to maximise that, and some of the way we can do that is bringing in investors," he said. It isn't just the mega-wealthy that are attracted to New Zealand. Sarah Coombes-Crome, an immigration consultant, said that traffic to her firm's website was up approximately 600% the day after Donald Trump won the election and has remained higher than average. "They are from all over the United States and are educated, looking to either work in New Zealand or invest if they have a considerable amount of capital behind them." "I think New Zealand and the United States are very similar," she said. "They are both English speaking countries, they think similar, they have the same values and similar religious beliefs. It's also very easy to buy a property or do business in New Zealand, you can move your money around freely." Chris Whelan, the chief executive of the Wellington regional economic development agency, says the country offers plenty of career opportunities, but with a much better lifestyle that you would find elsewhere. "I was talking to someone out of San Diego this morning and he's looking to invest potentially tens of millions of dollars in New Zealand. "For him it's got excellent skills, excellent talent, and what was previous a boundary (distance)… with modern technology you're connected to the world all the time. "It's a country with a similar land mass to Britain but with 4.4 million people."